History: (X-Men Millennial Visions 2001 - "New Mutants: First Soldiers" (fb) - BTS) - After watching mutants hunted for years, Magneto declared war on humanity and was joined by Charles Xavier when his students were killed in the destruction of the X-Mansion. In order to quell the mutants, S.H.I.E.L.D. kidnapped the family of Reed Richards and forced him to create a virus that would attack mutants. When Reed succeeded, he was horrified by the deaths caused by his virus and escaped to Mars with his family and four infant, mutant test tube babies. 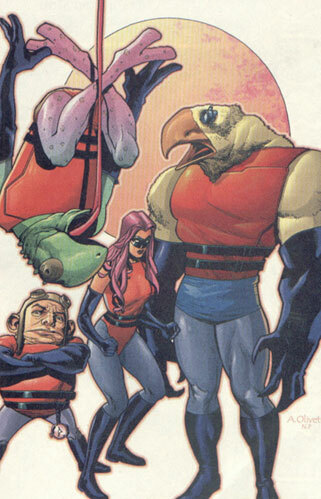 (X-Men Millennial Visions 2001 - "New Mutants: First Soldiers") - Reed worked with the children as they grew and took the names Frodo, Lys, Tarf, and Trago. He trained them as their mutant powers manifested to become the first soldiers in a new war on Earth. Comments: Created by Jorge Lucas and Ariel Olivetti. Frodo was one of the infant mutants saved by Reed Richards. As he matured, he developed the mutant abilities to temporarily freeze time, allowing others to move at superhuman speed. --X-Men Millennial Visions 2001 - "New Mutants: First Soldiers"
Lys was another of the mutants saved by Richards. At adolescence, she manifested telepathic and shapeshifting abilities. 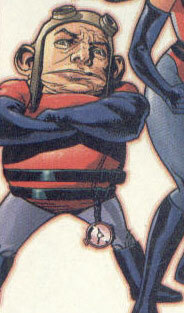 Tarf was one of the mutants taken to Mars by Reed Richards. His mutant powers manifested in the form of transforming into an eagle-like man with feathers and a beak. He was also gifted with optic energy beams. 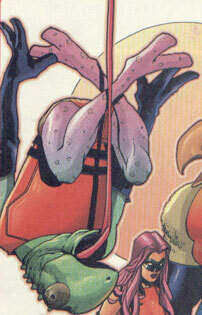 Trago was a mutant saved by Reed Richards, who manifested a chameleon-like appearance at adolescence. With his appearance came the ability to blend into his surroundings and secrete a paralytic venom from his hands.